One of the things that seemed to stun the hockey world this year was the way Tampa Bay Lightning head coach Jon Cooper used rookie forward Jonathan Drouin. Drouin, the team's third overall pick in 2013, played 70 games during the regular season, but was relegated to 'popcorn duty' (i.e. the press box) for most of the playoffs. People were confounded. Why wasn't a guy with that much talent and that much playmaking ability stapled to Steven Stamkos's wing all year long? The answer seemingly lies in Cooper's development philosophy. Simply, young players have to pay their dues. The example bloggers and fans used to highlight and exemplify that point about Cooper's philosophy was Nikita Kucherov. 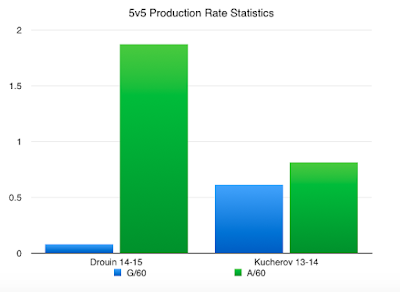 Kucherov, like Drouin, is young and bursting with talent. He debuted with Tampa Bay two seasons ago, and played 52 regular season games and two playoff games before being scratched in favor of B.J. Crombeen (yikes). That's not unlike Drouin, who played 70 regular season games this year for the team before being scratched in favor of guys like Brenden Morrow and Cedric Paquette during the playoffs. Of course, we all know what happened with Kucherov in 2014-15. He built on his nine-goal, nine-assist 2013-14 campaign and turned in a 29-goal, 65-point season. The speedy evolution from healthy scratch to dominant offensive force was something special. Kucherov is now viewed as one of the Lightning's most important players. The question now is whether or not we can expect the same sort of growth from Drouin. These possession numbers are fairly comparable. Kucherov's were slightly better during his rookie season, but it's hard to make a huge distinction on the surface. Granted, Drouin did play on a markedly better team during 2014-15 than Kucherov did in 2013-14. 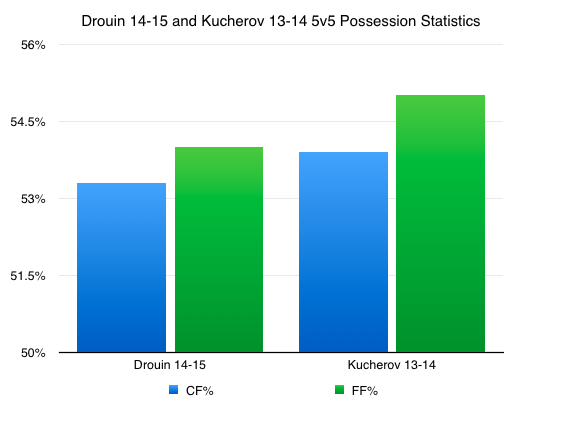 Kucherov was a true possession leader for the team two years ago, whereas Drouin was *merely* (note the sarcastic emphasis) an above-average possession driver. The bottom line is that both were very impressive in the possession department (Corsi/Fenwick) during their respective rookie seasons. Beyond possession, there's the question of actual offensive production. The disparities there speak for themselves. Rookie Kucherov scored at a better rate than rookie Drouin, while rookie Drouin helped out at a better rate than rookie Kucherov. Drouin's ability to assist during 2014-15 was nearly unparalleled around the NHL; only one player in the league (Tyler Johnson) assisted at a better rate. That's quite amazing when you consider that Drouin's most common five-on-five linemate was Cedric Paquette. Vaunted playmakers like Henrik Sedin, Joe Thornton, Ryan Getzlaf, and Sidney Crosby couldn't match Drouin's output rate. That's not to say that he was a better player than those guys, but it really speaks to Drouin's ability to produce assists. Now, the naysayers will point out that Drouin's G/60 bar is quite low. That's indisputable. Drouin scored only two goals during 2014-15, which obviously isn't fantastic. Still, it would be almost impossible not to predict an improvement in that category moving forward. His five-on-five shooting percentage during 2014-15 was 1.6%. That's unsustainably low, especially when you consider that J.T. Brown shot at 4.2% during five-on-five play this season. There is no way Drouin's shooting percentage, a largely variable statistic, doesn't rebound next year. For what it's worth, Kucherov's five-on-five shooting percentage more than doubled year over year. This analysis clearly shows that there are a number of reasons to be optimistic about what Jonathan Drouin can do during 2015-16. Every critique thrown his way this past year was thrown at Kucherov two seasons ago. "He's not good enough defensively," they said. "He's a giveaway machine," some cried. Well, look at Kucherov now. I'm guessing we'll be just as impressed with Drouin by the time next summer rolls around.